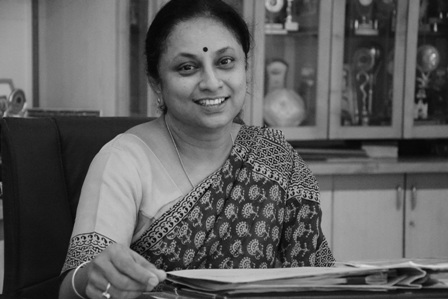 Mrs. Sawant says- Every child has the inherent capability of exuding the aura of knowledge. We at GWALIOR GLORY strive to deliver the knowledge and groom every child to a confident personality and a good human being. I wish to express that Gwalior Glory High School has braced itself to stand the tests of time. The school has an elaborate system of activities and learning experiences to bring about modification of behavior of its students in the desired direction. The child that my teachers and I nurture in the garden of Glory with the ever supportive and encouraging management grows into an authentic flower full of fragrance, able to brave the rough weather. Good character and experience qualify any man for the service of his country and I vouch that my students will stand as strong individuals, think globally act locally and uphold the glory of our nation. Educating the young ones in the society is a Herculean task entrusted to schools today.It has become complex where knowledge ,skills and attitudes need to be delivered by a team of specifically trained teachers for different tasks. With globalization having come to stay,wider vistas are thrown open with certain inherent vices being a part of virtues that it is associated with. The electronic media has become a powertful means of mass communication and influence of western culture is on the increase. When such is the crossroads we are standing at, I wish to express that Gwalior Glory High School has braced itself to stand the tests of time .The school has an elaborate system of activites and learning experiences to bring about modification of behavior of its students in the desired direction. While, debating, holding seminars, group discussions etc. are a part of co-curricular activities, celebration of national and religious festivals and other important days, observing of certain sensitive issues such as AIDS, care for the elderly. etc. and conducting special activities on such ocassions like staging of plays and presentation of cultural activites are instances of extra curricular activites.The holistic development of the pupils is given a boost. Physical education not only develops the child's physique but also secures the emotional and the social development .Teams of children working together offer abudent opportunities to develop endurance, cooperation, self-discipline, fair-play, leadership and sportsmanship.The sports department follows clearly defined curriculum with details of games theoretically and practically taught to the children. The school believes in inter-active style of teaching and learning instead of the prevalent expository style.Stress is paid to develop such qualites as independent thinking, originality, creativity, critical thinking, scientific temper etc..The teachers here are more of facilitators of learning.Curriculum transaction is pupil centered rather than teacher centered.Students are involved in a variety of modes of activities such as observation, projects, assignments, demonstration and experimentation, playway activites, role playing and dramatization, discussion,etc. Twelve years of schooling at Glory makes a student competent to show a certain aptitude in a specific direction.The aptitude reveals characteristics which indicate his future potentialities. It is desirable that parents see that their child is directed at the end of class X to a course of study according to his aptitude so that he maximises his potentialites.The senior secondary stage makes the student decide his future course of action,vocation or profession. Character development is of prime importance in the educational process. This is the reason why the school has an open climate where the teachers and students are not hindered in their work.They are friendly and motivated enough to overcome difficulties and frustration.The student is free to approach the teacher whenever he/she has a problem not only related to school and studies but also related to friends,family,health etc.The school emphasizes on a strong value system where the moral,spiritual and ethical qualities are gradually built into a student so that he is able to decipher clearly between the good and the bad,the right and the wrong,the positive and the negative. To sum up, the child that my teachers and I nurture in the garden of Glory with the ever supportive and encouraging management grows into an authentic flower full of fragrance, able to brave the rough weather. 'Good character and experience qualify any man for the service of his country 'and I vouch that my students will stand as strong individuals,think globally act locally and uphold the glory of our nation.